Please see our Mechanic's Gear category for more choices. 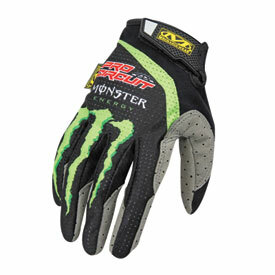 Pro Circuit has teamed up with Mechanix Wear to create the new Team Monster Energy/Pro Circuit Vent Glove to give your hands the protection and ventilation you need when the head is on. A fully perforated synthetic palm combined with a breathable mesh back-of-hand allows air to circulate throughout the entire glove on those sauna-like summer workdays. Strategically placed micro fleece on the thumb panel serves as a convenient place to wipe the sweat falling from your brow. Breathable mesh material minimizes heat buildup. Vented reinforcement panels increase durability. Thermal Plastic Rubber (TPR) hooks and loop closure provides a secure fit. Great glove for everyday riding, just wish they were a bit more durable.Still some sick gloves and would buy again! I bought these to work in my garage at home. Wasn't too impressed, very thin material. I don't expect them to last very long. I work as a power sports technician and have had other brand gloves that cost less and were made of better material. Overall that are a pretty cool looking glove, just not ment for daily use. tired of cutting up my hands trying to get those little bolts in tight spots. they work good, do the job they are supposed to. Durable , comfortable and awesome design ! Awesome gloves. Very durable . design is awesome .